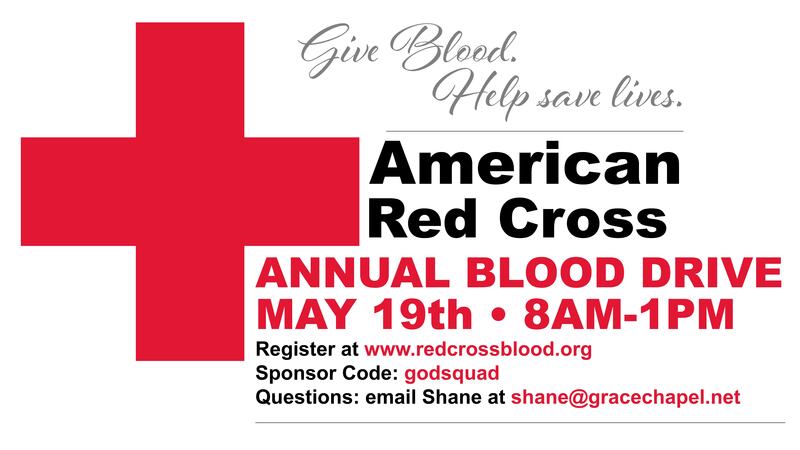 The American Red Cross Blood Drive will be here on May 18th right outside the Family Room from 8am to 1pm. Give blood, help save lives! If you are interested in volunteering for this event, email shane@gracechapel.net for more information. The American Red Cross Blood Drive will be here on May 18th right outside the Family Room from 8am to 1pm. Give blood, help save lives! If you are interested in volunteering for this event, email shane@gracechapel.net for more information.